Anthony Culpepper, left, with Mountain Studies Institute, and Daniel Lassman, a volunteer with San Juan Watershed Group, work on an Animas Watershed Partnership water-quality project along the Florida River. The group is tracking how well a fenced corridor along the river will improve water quality. A new fence created a corridor along the Florida River about a mile long is meant to improve water quality. The buffer zone is meant to encourage the plants to filter out nutrients that are causing harmful algae blooms in the Animas River. 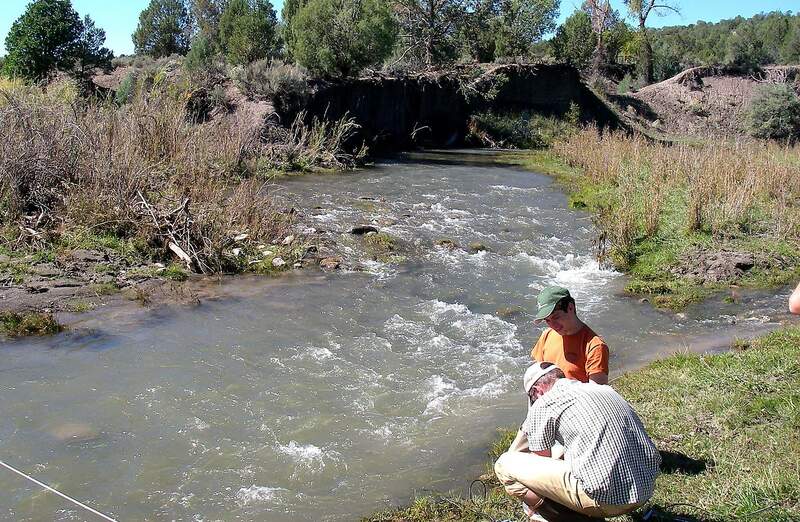 Potentially, harmfully high levels of nutrients are flowing from the Florida River into the Animas River, and one project is hoping to make a dent in the problem. 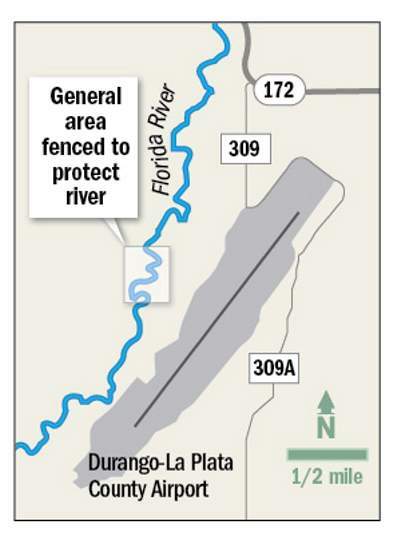 The Animas Watershed Partnership and rancher Keith Fassbender recently finished fencing almost a mile of the Florida River west of the Durango-La Plata County Airport as part of the effort. 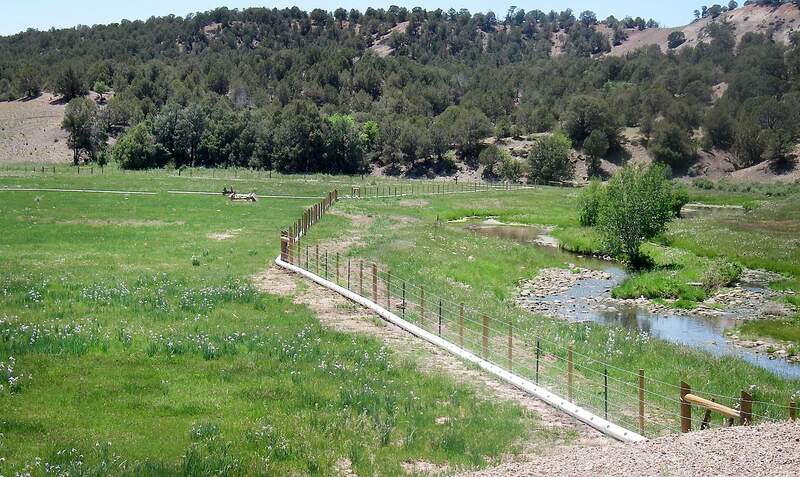 Fassbender built the fence that creates a 30-foot buffer on either side of river to keep cattle out of the area, as part of a $159,000 grant project, said Ann Oliver, coordinator for the Animas Watershed Partnership. The corridor runs across both private land and land owned by the airport. The group plans to track the water quality in the area over time to measure the fence’s effectiveness. “Farmers and ranchers, we are conservationists. ... We want to see what’s going on. We’re going to try to protect water qualities and our vegetation because that’s how we make our living,” Fassbender said. Cattle manure and fertilizer can heighten the levels of nitrogen and phosphorous in the river and contribute to algae blooms. These blooms reduce the oxygen in the water and harm aquatic animals. By creating a buffer, the group hopes to encourage the plants near the river to filter nutrients and sediment. “It’s going to be fun to see the buffer develop,” Oliver said. The Animas Watershed Partnership received $159,000 from the Colorado Department Public Health and Environment to build and monitor the effectiveness of the buffer zone. The group provided $280,000 in matching and in-kind donations to the effort. As part of the project, the group also helped Fassbender expand a piped irrigation system that prevents irrigation water from carrying fertilizer into the river, Oliver said. The group will test water quality in 2016 and 2017 after the buffer has time to develop. The Animas Watershed Partnership is a collaborative organization that brings together many groups with an interest in protecting water quality. The group formed in 2002, after major algae blooms in the Animas River. In 2010, the group identified the Florida River as being one of the top five largest sources of nutrients to the Animas River in Colorado. Agriculture is only one contributor of high levels of nutrients, and the group has not yet identified all the possible sources. “We’re not pointing the finger at any one thing,” Oliver said. But the partnership hopes to work with more landowners in the future to help reduce nutrient levels in the river.